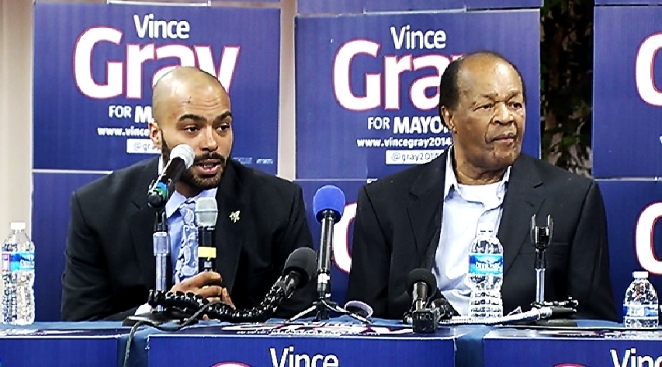 Christopher Barry, the son of the late Marion Barry, filed papers Monday for the special election to fill his father's seat on the D.C. Council. Marion Christopher Barry, 34, picked up nominating petitions at the D.C. Board of Elections on Monday. He has no election experience but said he wanted to carry on his father's work. Barry said in a tweet that "the legacy continues" in the District's Ward 8. Marion Barry died in November at age 78. His son is now one of 23 candidates trying to make the ballot for an April 28 special election to replace him on the council. The elder Barry represented the poorest section of the city for the last 10 years of his life, and he remained beloved in the majority-black ward even though his citywide popularity never recovered after his 1990 drug arrest. His son, who goes by Christopher, will be listed on the ballot as "Marion C. Barry" if he qualifies with enough petition signatures to get his name on the ballot. The younger Barry said in an interview that he's always had political ambitions even though he hasn't discussed them publicly. He said his father urged him to run for the seat one day. "I always admired him, not just as my father but who he was as a leader, and I always took notes when I was around him," Barry said. "I've been living this for 34 years. It's really a part of my life. It's kind of like second nature." In 2011, the younger Barry was sentenced to 18 months' probation on a misdemeanor marijuana charge. Last year, he was arrested for driving under the influence and operating a car without a license. He also faced a separate case of unlawful entry. He pleaded guilty to the driving on a revoked license charge in December and is currently serving nine months' probation and undergoing drug and alcohol treatment. "That's definitely all behind me. Like most young people, I've gone through my phases and experimented in drugs," Barry said. "I paid a great price for that and I've learned from my mistakes. I feel as though that experience has made me more qualified to help people who have gone through rough times in life." Barry runs a small construction business that has worked as a subcontractor on city government projects, including school construction. He said that experience makes him well-equipped to provide economic opportunity to Ward 8 residents -- one of his father's signature issues. "My advocacy has been through the private sector, not through any public office," he said. "I've always tried to provide jobs and show people that hard work is the way you pull yourself out of poverty."